I realized that little by little and without noticing, I had accepted his illness and I had found new ways to relate to him, ways that were genuinely satisfying for both of us. I went to the Alois Alzheimer Center one day to visit Ed, my Romanian soul mate of 30 years. I didn't really want to visit because my visits were boring. And, I was angry about Ed's condition. I wanted my old Ed back, but I knew that was impossible. So I just forced myself to visit that day. Once I was there I spontaneously got an idea for a little game to play with Ed. 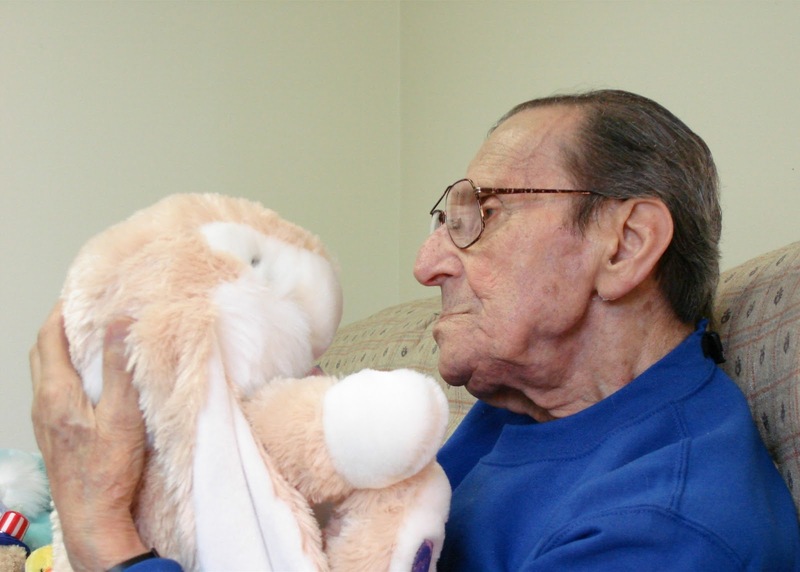 I started the visit by handing him one of his many stuffed animals, an act that always made him smile. I reviewed his growing collection and selected “Adorable,” the newest stuffed animal – a large bunny - I had given him, for the purpose. "Oh!" he said, his face shining as he stretched out his arms to take Adorable. "Oh! The lee-tle one! I love him so much." He put Adorable to his face and kissed him. And, as always, it was as though it were the first time he'd ever seen Adorable. Suddenly I turned my head away from Ed and pressed Adorable's nose. I said "beep" at the same instant. Just as I'd hoped, Ed thought Adorable said "beep." He looked at me and his eyes widened as he marveled at the bunny's new ability. Then he pressed on the bunny's nose and I went "beep" again. He laughed, pressed the button repeatedly, and I went "beep" each time. I burst into laughter myself. He laughed more, then turned to me and said, his voice full of wonder, "Listen what he does, Marie." He pushed Adorable's nose and I said "beep." "No, Ed," I said, laughing and deciding to reveal the secret. "I'm saying "beep" - not Adorable." "Oh!" he said. "You are wonderful. You are great. You are superb to make this "beep" just when the bunny's nose I press." He then exclaimed loudly and emphatically, "You could ask a hundred people and they would all say you are magnificent." He then repeated that sentence verbatim. Next he tried to trick me. He pushed the bunny's nose several times in a row very fast. I managed to keep up, saying "beep" each time. Then he suddenly slowed down, still trying to fool me. He is really alert today I thought. After that he picked up The Little Yellow One, the first stuffed animal I had taken him, and we played the same game with it. Ed kept praising me for being 'so magnificent'. We giggled like a mother and her two-year-old playing together. It was fun. One morning shortly after that I realized I was actually looking forward to visiting Ed. A profound change had taken place in me. I no longer felt bored, dejected, unloved and unloving during my visits. I enjoyed them and left feeling emotionally satisfied. It was clear I'd had a dramatic change of heart. And what was more, I could pinpoint the day it started. It was the day when we first played the Beep Game with Adorable. When I experienced his joy at that tiny stuffed animal and our funny games my heart began to be transformed. Gradually my need and desire for my 'old Ed' began melting away as I realized that I could bring joy to my 'new Ed'. The man who had lost so much was in a state of child-like bliss thanks to my small gifts and the games. His fervent gratitude for the many little stuffed animals I later took him, the fun he had playing with them, and his joy with all the other little games I subsequently invented, all made me feel joyous, too. Just seeing him smile and hearing him laugh had become more than enough to make up for losing our previous relationship. My heart had changed forever. Our love had endured, even despite Alzheimer's - the last and most daunting obstacle it would ever face.